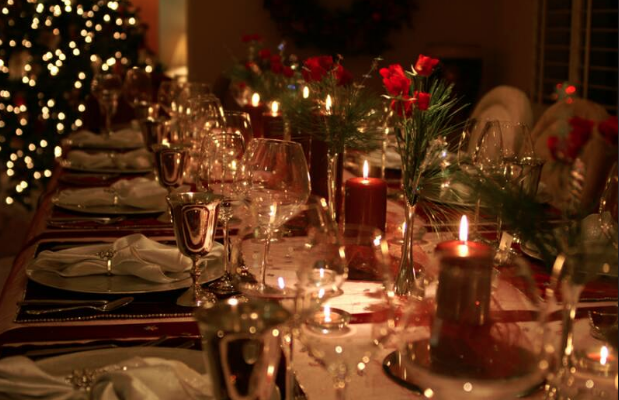 In this rich season of giving and receiving, with American Thanksgiving just past and winter gift-giving coming soon, I wanted to offer this special article again, on the nature of giving and receiving. We musicians are born with the ability to receive immense joy from music. It moves us so much that we feel compelled to get as close to it as possible by actually making music – by producing the sounds with our instruments and our own bodies. And sometimes we feel ourselves overflowing with the energy in a piece of music, and we want to share it with others in performance. Sadly, however, we often get caught in a less positive experience. Faced with the complex athletic and musical demands involved in mastering a piece, we find ourselves in a tangle of frustration. If a phrase or passage doesn’t go quite as we would like, we may start pushing ourselves to master it. We become fiercely determined to “nail” it. And before we know it, this intense determination creates tension in our body, limiting the amount of joy we can take in or transmit to others. The names I use for my approach – including Performing Beyond Fear and the Art of Practicing – point to a way out of this joy-killing habit. Let’s look at what some of these potent words mean, and then at two basic steps you can take toward becoming a true artist in the practice room and a fearless performer onstage. What Is Going “Beyond Fear” for a Musician? Although we think of going beyond our fear primarily in terms of being onstage, it actually begins before we get there. A student of mine once described his practicing as a laboratory for working with fear. He realized that his habits of glossing over details in music, indulging his emotions at the piano, and pushing himself to reach his goals, were keeping him from delving deeper into his creative power – into who he truly is as a musician and artist. As we worked together and he gradually let go of his habits, he began to unmask the core of his heart while practicing and to connect with music on a whole new level. It was scary to be that vulnerable and open – he could feel he was entering unknown territory over and over – but he bravely opted for discovering the depths of himself instead of settling for his safe, habitual way of relating to music and the piano. When you practice this way, you develop the habit of going beyond fear. This is a huge advantage when you walk onstage to perform. What is Art in Practicing? Art and performing beyond fear come together when you practice the way my student described. Being an artist means opening yourself to the full beauty and power of music, and to do that you have to open to the full beauty and power in yourself – to the deepest and most genuine place you can find in yourself. From there you can be truly free and spontaneous in practicing, rather than engaging in rote repetition of passages. This is not always easy. To bring all of yourself to every moment of your practicing, you have to trust your body, your mind, and your sense perceptions from moment to moment, and to follow your intuition rather than relying on familiar concepts of how to play a phrase or how to create a particular musical effect. You have to constantly look within yourself to notice your genuine response to what you are hearing, rather than measuring your playing according to preformed concepts or the standards of others. This means, for instance, that while you’re playing a phrase, you pay attention to the exact sensations occurring in your body – the sensations of touch and movement and of the sounds affecting you inside – and you literally feel your way toward an authentic connection with the music you’re making, instead of judging in your head how “good” your playing is. It’s challenging to practice this way because you are a unique individual. You can never know where you’re headed on the path of becoming the artist and person you’re meant to be. There is no map. All you can do is trust yourself and feel your way from one moment to the next. This is called being creative! Although it can be scary to be the pioneer in your own journey and to forge ahead without a map, you don’t need to despair. Others have faced their own mapless pursuit of authentic musicianship and artistry, and they can provide valuable guidance for you on your own journey. Here are two steps gleaned from my particular mapless search toward going beyond fear in the practice room and onstage. Of course, these two steps are hardly a complete recipe! But if you follow them, you can begin to open up a whole world of rich, genuine musical experience in practice and performance. The first step is to muster some sympathy for yourself for facing the reality of being a musician. It is so much harder than most people think. Scientists consider playing a musical instrument the most complex neuromuscular activity that people engage in. It is, in fact, so complex that images of classical musicians’ brains stand out as the only brain images that are clearly recognizable as belonging to a distinct segment of the population. Coordinating two hands, maybe your feet or your mouth and jaw, your lungs and entire breathing mechanism, along with massive sensory input, refined intellectual concepts, and a vast range of emotional energies – what could possibly be more demanding? And then to do all that in front of an audience??? So give yourself a break. Appreciate how hard it is. There is a reason you are often frustrated and may even lose heart at times. In fact, give yourself frequent breaks. Don’t push yourself in the practice room. Notice when you’re getting tense, frustrated, or upset, and just stop. Stop and relax, for even a few seconds. Take a deep breath or two. Allow yourself to refresh your mind and spirit a little. You’ll bring much healthier energy to your practicing. And while you’re at it, extend some real kindness to yourself. Remember that you have worked so hard for so long to become the musician you are now, and appreciate yourself for continuing to put in the effort, day after day. Appreciate your love for music and your dedication and bravery in pursuing this extremely difficult art. Give yourself an imaginary medal. You deserve it. Not because of your ego, but because of your strength of heart. Now that you have softened toward yourself, let yourself enjoy the music you are making. I once read that a true musician is someone who is in love with the raw materials of music. Every melodic interval, every harmony, every rhythmic pattern, every silence in a piece of music is something to savor. All of it is music to our ears – if we can get off of our fast, self-deprecating, and self-denying track and just open ourselves to it. So when you’re practicing, try listening in very slow motion. Take the liberty of effectively holding a magnifying glass over every sound in a phrase. Notice the amazing juxtaposition of notes, the constantly changing stream of colors that music is. The unbelievable range of human expression it contains. Come back to your senses by spending several seconds tasting each single sound. And do this a lot. Take some time every day to fill your whole being with the sheer beauty of musical sounds. Having let yourself receive the riches of sympathy and beauty, you now have more to give to others – in performing, in teaching, or just in being with other people. You have fed yourself healthy energy, and people will feel more comfortable around you, even warmed by your presence. Then you can receive something even more amazing – the deep fulfillment that comes with giving something to others from an open and joyous heart. We all need to remember what a powerful and essential healing force music has been since ancient times. Thousands of years ago, human beings gathered together to express deep emotion through music and to share it with each other. Today, we may come home after a long day and listen to music that melts away our stress or releases our pain. Or we may discover a new video online of one of our favorite performers and immediately share it with friends and family. And then there are times when we gather with a large group of people for a special concert to experience our shared humanity as a great artist creates magic from their own human heart onstage. So for those of us who are lucky enough to actually be musicians, we owe it to ourselves to revel in the beauty of music as we magically make it ourselves. It can nourish us like nothing else quite can. Oh, my fellow musicians. I so want you to take all of this to heart. You work so hard to make music. In the middle of your hard work, please remember what it’s for. Be your own true listener. Love your own musician’s heart, and feed it every time you practice. Take time to deeply receive the music you are making. P.S. If you’re ready to receive a HUGE gift, join us this July at The Art of Practicing Institute’s unique and amazing weeklong summer program, Mindfulness, Confidence & Performance, July 20 to 27, on the beautiful campus of Edinboro University. I struggle with a very competitive nature. I am always comparing myself to others and find myself constantly feeling inadequate. How do I let go of comparing myself to others? Also, how do I keep it from discouraging me? This is a great question—one that many people struggle with. I think all of us, to one degree or another, tend to compare ourselves to others in different areas of our life. We tend to judge ourselves. Even reflecting on how universal this tendency is can help you relax about it a little. Then it has less power over you. One key to working with this tendency actually lies in the experience of feeling discouraged. When we feel discouraged, it contains sadness, which is a core feeling, a deep heart feeling. If you tune into that underlying, painful sadness—“I wish I felt better about myself; I feel hopeless”—you are touching something raw and vulnerable in yourself. Realize that this vulnerability is good. In fact, it’s the place where music can really touch you, and from which you can make music authentically and connect with other people. You can feel proud of yourself for being willing to feel it and admit it–that you are not hiding behind a false confidence as so many people do, pretending that they feel completely fantastic about themselves and that everything is hunky dory. Once you’re in touch with that core of sadness, you can take a little time to let it flow through you, just like music flows through you. We need to give feelings plenty of space to flow through like that—to respect and value them, and to take care of ourselves that way. Otherwise they can just pile up and create blocks to our energy. If you open to it and let it flow through, you might then find yourself more open to music. People usually play better after taking some space for themselves. The other very important thing to do is to seek guidance from a good teacher—to make sure that the way you’re practicing your instrument is really serving you and helping you play as well as you can. No one can do it alone, and in seeking help from someone else, you are honoring your own intelligence—it means you already have the wisdom to sense that you could benefit from some guidance. So you could take heart from that and follow your intelligence. In that way, your intelligence will keep developing. ​Submit a question for possible inclusion in next month’s issue of Performing Beyond Fear. This entry was posted in Uncategorized by Madeline Bruser. Bookmark the permalink. One of the leading piano teachers in New York City and author of the highly acclaimed book The Art of Practicing: A Guide to Making Music from the Heart, Madeline Bruser gives private piano lessons and workshops at her studio on the Upper West Side of Manhattan. She is also now giving lessons on Skype so that musicians around the world can benefit from her teaching. 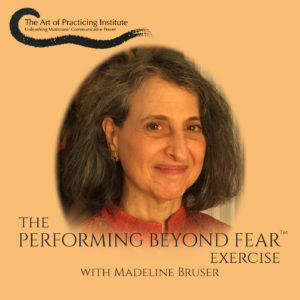 Get past stage fright with the Performing Beyond Fear exercise – Madeline’s new audio release.